I will use USBKeyboard class as an example. STATE_NONE - initial state (disconnected). STATE_CONNECTING - establishing Bluetooth connection. STATE_CONNECTED - Bluetooth connection established, configuration data can be now uploaded (library takes care of it). STATE_READY - USB host set device state to "configured", now it can be used. public void setContext(Context context) - used to pass application context. public void setMac(String mac) - sets Bluetooth MAC address of InputStick device (usually loaded from applications preferences). public void connect() - initiates connection to InputStick. public void disconnect() - disconnects from InputStick. public int getState() - returns current state of connection. public void type(byte modifier, byte key) - presses and releases key and modifier (Alt/Crtl/Shift/Win key). public void type(String toType) - types content of passed String. public boolean isCapsLockOn() - returns current state of CapsLock. public boolean isNumLockOn() - returns current state of NumLock. public static byte isKeyCode(char c) - translates char to HID key code (codes used by USB keyboard). When Activity is created, init() must be called to pass all necessary parameters. When user clicks "Connect" button, library will try to establish Bluetooth connection (remember that application requires permission to use Bluetooth!) and configure InputStick device. Every time connection state changes it will be reported using onUSBEvent, which can be used to enable/disable parts of user interface (for example: "Type" button). When Activity needs to type some text, "type" method should be used (it will type text and press enter key). Finally, when user clicks "Disconnect" button, application will terminate current connection. 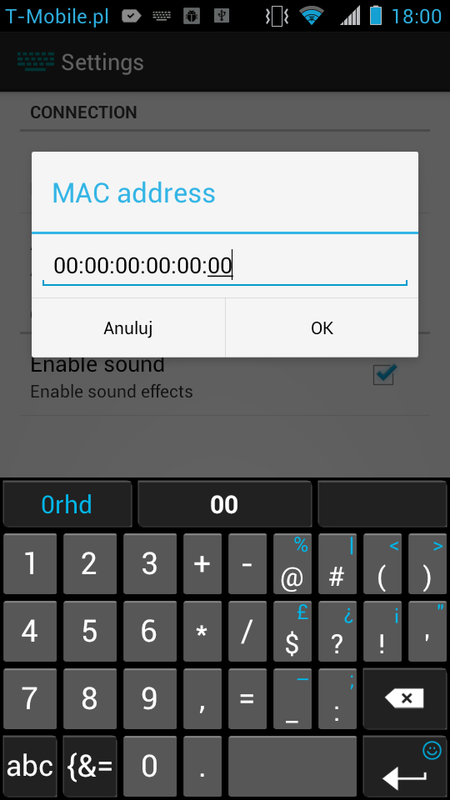 In order to connect smartphone with a InputStick device it needs to know its Bluetooth MAC address. In demo applications it has to be entered manually, but Bluetooth device discovery might be implemented as well. In both cases whole configuration process shouldn't take more than 30 seconds and has to be done only once. 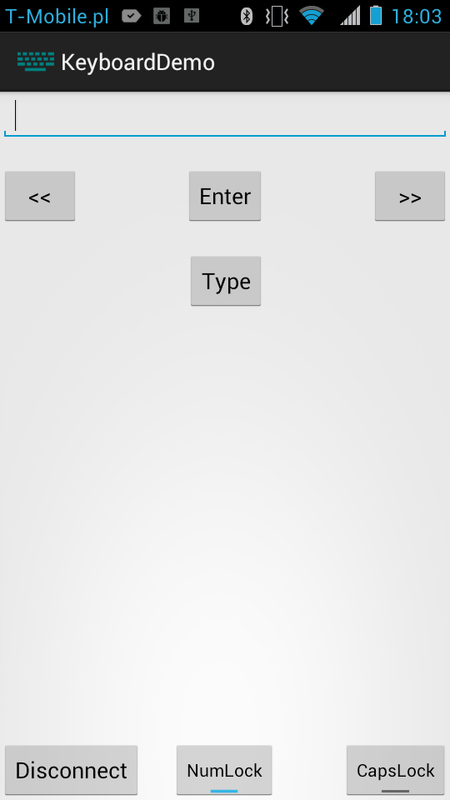 Keyboard Demo application, not connected yet. Keyboard Demo application, connected with InputStick. 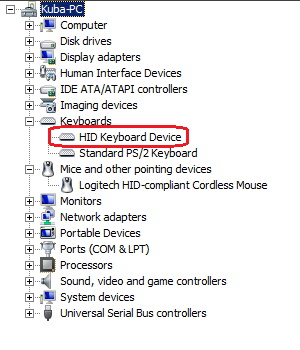 InputStick appears in Device Manager as a standard USB keyboard, so there are no special drivers required. Since OS thinks it is a physical keyboard, you can use IS to do anything that can be done with real one. Here you can see main activity screen of Mouse Demo application. 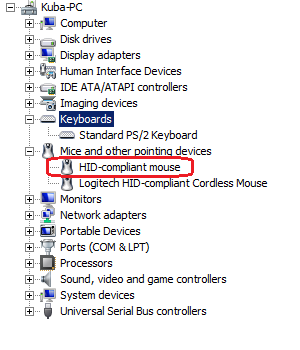 LMB and RMB stands for Left and Right mouse button, remaining empty area is used as a touchpad. Just like in previous demo, OS thinks its a real USB mouse... because well, actually IT IS! So, that's it for now, in next few days I should prepare some more demo applications. Here are some photos I've made yesterday, while assembling InputStick prototype. Unfortunately I didn't make any while soldering components. Whole assembly process took about an hour. On the bottom side there is a STM32F102 microcontroller, which takes care of handling USB protocol. If you take a closer look you'll notice, that uC pins are not perfectly aligned with footprint (probably worst example of my LQFP package soldering), still it works just fine. On the top side there is a Bluetooth serial adapter module, which allows to wirelessly communicate with a smartphone. Since most pins of the module are not used, I didn't include them in footprint, what made PCB routing a little bit easier. As you can see I had to cut PCB in order to fit it into enclosure. Since it's just 0.8 mm thick I was able to do that with scissors :) I also drilled four holes in top enclosure cover. Why? You'll see soon. I guess that now it's clear why I needed holes in the enclosure. Since firmware still requires a lot of work, I often have to upload new version or work with debugger. To do that, I just need to plug four wires (SWDIO, SWCLK, RESET and GND) and connect it with ST-Link/STM32Discovery board, no need to remove PCB from enclosure. Whole process takes something like 30 seconds. Next time, I'll post videos of InputStick in action. I've decided to start this blog to document process of developing InputStick. Have you ever wanted to make your smartphone a USB mouse, keyboard or maybe a gamepad? Now you can! And there is no need to install software or configure network. First, let's start with some basic information. What exactly is the InputStick? Well, I guess that "Smartphone to USB Wireless Adapter" is most accurate description. InputStick is a small USB device, which together with smartphone (connected via Bluetooth), allows to emulate USB devices. InputStick takes care of handling USB protocol, while all logic and interaction with user is performed on a smartphone. Using Bluetooth as a communication link introduces latency and bandwidth limitations, so while keyboard can be emulated without any problems, don't expect much in case of mass storage class. 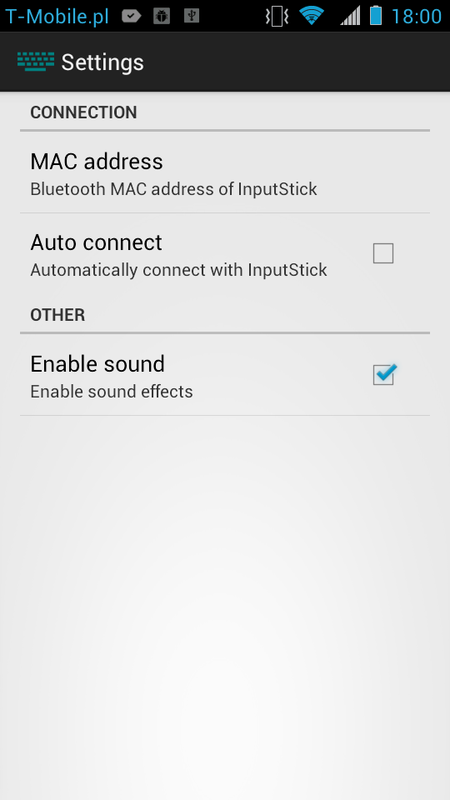 At this time InputStick is able to work with Android/Java2ME devices. Plug InputStick into USB port. Nothing happens... for now. Start application. Application connects to InputStick and sends configuration data. System recognises new USB device (for example: USB keyboard). Application can now act as an USB keyboard: press and release keys. 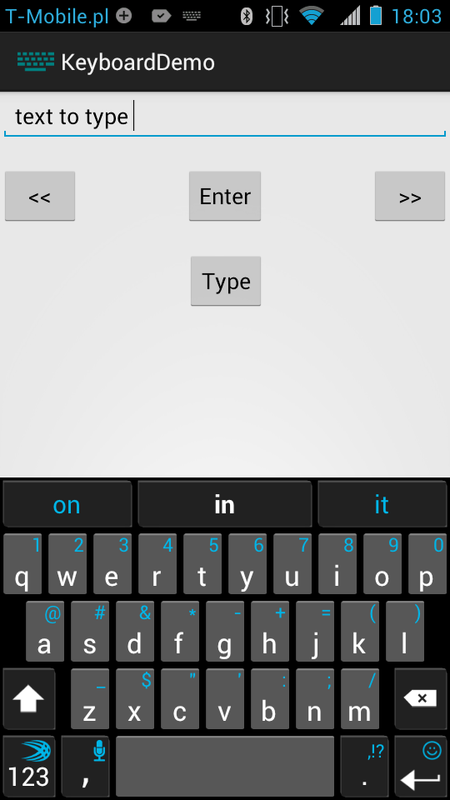 Password Manager application - use your phone to type your user name and password for you. Keyboard & mouse - control your PC, game console, smart TV. Gamepad - use your phone as a gamepad. Barcode scanner - use your phone as a barcode/QR code scanner (it can type scanned data!). RS-232 - use your phone as a virtual COM port. Important thing is that InputStick is compatible with almost any USB host: PC (Windows, Linux, Mac), Android, game consoles, Smart TV etc. Of course, such host must be also able to work with device that is being emulated (every mentioned host will be able to work with USB keyboard, but don't expect Xbox 360 to make any use of USB thermometer). additionally you may implement callback methods which will allow to receive notifications about current state of connection and receive USB reports (in case of keyboard: NumLock, CapsLock, ScrollLock status).